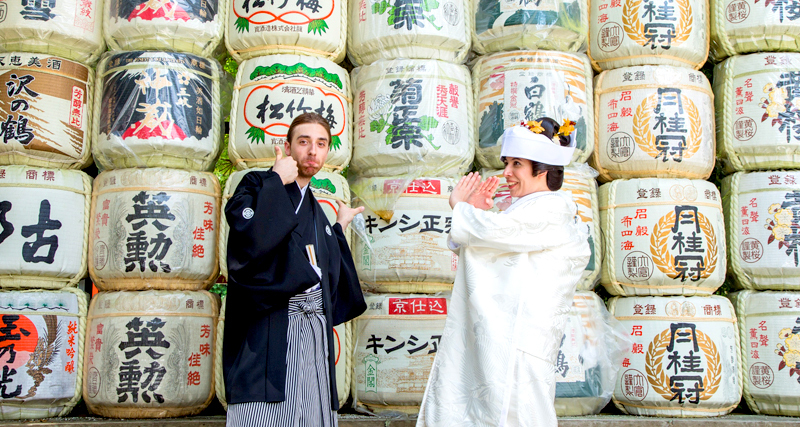 Niccolo and Patrizia are from Italy and got married at Kamigamo Shinto Shrine. They were such a lovely and friendly couple. Niccolo had medium-long hair, so when he wore his Montsuki and Hakama and fixed his hair-style, he looked just like a Samurai. Patrizia chose a white wedding Kimono (Shiromuku) for the wedding ceremony and wore a Japanese wig and Tsunokakushi. Niccolo and Patrizia could not speak Japanese, but they practiced very hard in order to read their vows in Japanese. They took many cute photos at Kamigamo Shinto Shrine. Congratulations! Wishing you a future filled with happiness. Hope to see you again someday in Kyoto or Italy.